Is versatility is the new #1 requirement for the storage system? Not all data is created equally. Performance, density and reliability are just the starting point as IT managers choose the right storage. Emerging architectures and software layers, virtual environments, demanding applications, energy, rack-space and budget considerations all mean that the storage system must be the right fit. Hardware matters more than ever. 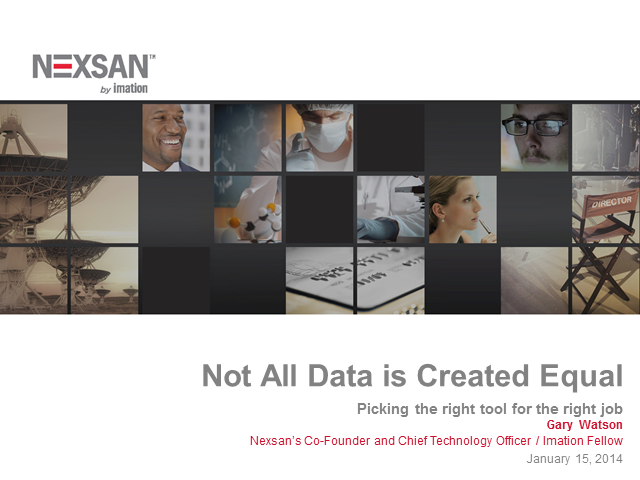 Join Gary Watson, Nexsan Founder and Imation Fellow as he presents changes in the IT industry and the latest concepts in storage that meet the evolving needs for performance, reliability, density and versatility.